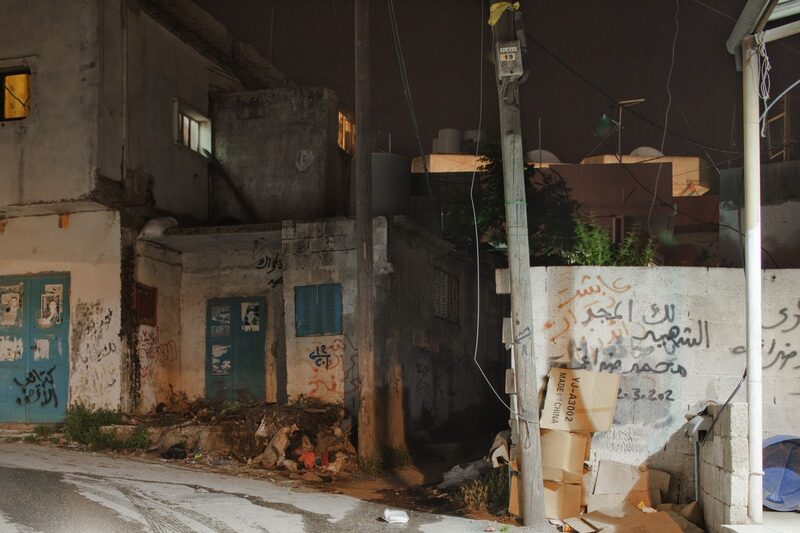 The political and social evolution of Dheisheh has been inscribed in its urban form. Dheisheh is no longer made of tents. It is a completely original urban structure that has been assembled and developed by necessity and through the creativity of its inhabitants. Simple architectural transformation from opening a new window to fixing the roof carry huge political implications. Spatial practices have taken the form of rituals and architectural realizations, expressions of rebellion and necessary adaptations to the present reality. They oscillate between pragmatic solutions for a congested space and visionary celebration of an idealized past. These interventions, more or less unconsciously represent a will to reproduce the spatial qualities and characteristics of the refugees’ villages of origin; they constitute stubborn and spontaneous acts of preservation. Individual homes contain traces of historical moments in the wider evolution of the camp and Palestine as a whole, and a series of collective buildings challenge the stereotype of the refugee camp as solely a site of marginalization, subjugation, and poverty. The United Nations Relief and Works Agency (UNRWA) was established on December 8, 1949 by the UN General Assembly. Resolution 302 (IV) determined that the Red Cross would continue its work of providing basic services to refugees until March 1950, after which point UNRWA would take responsibility for humanitarian assistance to the then-700,000 Palestinian refugees. As time drew on and Palestinian refugees were still unable to return to their villages, the tents and plans they were originally placed in became ill suited for continuing occupation. By necessity, families begun modifying their environment for sustained inhabitation, such as digging channels around their tents to prevent their floors from turning to mud as the cold winter rain came. In 1951, UNRWA began constructing more solid housing units commonly referred to in the camps as “shelter rooms.” Each family was given one room whose size was determined based on the number of family members living within it to a rule of 1m² per person. Single-room shelters were built for single mothers or single women who remained alone after the war. Huts ranged in size from 3x3m² to 3x5m² and tended to have an internal division to create the effect of two rooms. They were located adjacent to one another and every fifteen shared one bathroom. From 1955–1964, with over 470,000 persons receiving assistance by the shelter program, camps begun to assume a form and organizational logic very different from how they started. Yet the shelters were built to serve a maximum of five years, and many more went by without a political solution. Refugees were thus forced to adapt again to the circumstances in which they found themselves and began developing self-built structures. A significant factor in the emergence of this type of construction was that camps were placed near urban centers, which facilitated economic opportunity and exchange. In the early 1960s, UNRWA directors began to discuss the fact that the camps were growing out of control and beginning to resemble slums. As a result, an attempt was made not to forbid but to control refugee self-built housing. The shelter-based program was closed in the 1960s and replaced with a self-help program, which would provide building materials and monetary assistance to refugees instead. In 1967 the Naksa ended with the State of Israel occupying the West Bank, Gaza, the Sinai and Golan Heights, and created a second wave of refugees—many from the West Bank—who fled for Jordan and other countries. This greatly reshaped not only the camp’s structure but also refugees’ perception of the idea of return. Some refugees who were able to bought a piece of land outside of the camp and started a life in the city. Dheisheh’s population decreased, making it so that there was more space for those who remained. Plots of land were appropriated in endless negotiations between neighbors and borders were built to demarcated each family’s property. These complex negotiations of place and identity within the camp itself and with the city resulted in the streets, pathways and neighbourhoods assuming the form they have today. In the last twenty years, within the framework of the so-called “Peace Process” that subsequently led to the creation of an interim Palestinian Authority, the right of return was increasingly marginalized under pressure from successive Israeli governments who have never been willing to acknowledge Israel’s responsibility in the Palestinian Nakba. At the same time, the withdrawal of the Israeli army from most Palestinian urban areas created the conditions for some West Bank camps to become relatively autonomous and independent socio-political communities. A collapse of time between the camp’s beginnings and its contemporary reality. In one image, Dheisheh Refugee Camp (2012, left) and Doha City (1955, right), and in the other, Dheisheh Refugee Camp (1955, left) and Doha City (2012, right). Image: Campus in Camps, BraveNewAlps (2012). Khaled Al-Saifi was born in 1961 and grew up in a single-room shelter that was used as a bedroom, living room, kitchen, and bathroom. After their neighbors were displaced to Jordan in 1967, Al-Saifi’s family took over their abandoned shelter room, which they had the key for from before. Later that year they managed to acquire another shelter room after a long and tense negotiation process with their neighbors. Al-Saifi’s family then marked the boundary of their three shelter rooms and the respective plots of land with a single line of stone. Khaled described this moment as the beginning of a more individualized life, the giving up of a collective dimension in exchange for better living conditions. In 1974, a cement brick factory opened near the camp. Its founder—himself a refugee from Dheisheh—offered financial support to refugees. With this, Al-Saifi’s family was able to add two small rooms to their original shelter room and left the other two shelters to decay. Khaled led a politically active life that was interrupted by multiple arrests. During his time in prison in the first intifada, his wife, Umm Aysar, continued to work on the house and added two more rooms on the ground floor. After returning from prison, Khaled added a concrete slab roof to the house to prevent water from entering in winter, extended the structure upwards with columns and added another slab overhead to allow for future expansion. In 2002, after the second intifada, the camp was placed under military curfew for many months. Unable to leave the camp, inhabitants saw building as a form of resistance to the military occupation. Khaled used this period to finish the first and the second floor. A single feature that has witnessed this entire process of architectural transformation is a lone palm tree by the front door. While it cannot be definitively confirmed, this tree was likely born from a date seed thrown onto the land in the 1950s, when UNRWA gave out dates in food boxes. After the Nakba in 1948, the Naji Odeh’s family took refuge in Beit Sahour, a town close to Bethlehem. After facing social marginalization and exclusion from their neighbours, they moved to Dheisheh in 1959. The family consisted of eight members living in a single room of nine square meters up until the late 1960s. Their income was limited by the father’s illness and subsequent paralysis. In 1973, he passed away and the oldest brother, Fathi, left for Lebanon to study. Naji, the middle brother, was occupied with political action and spent a lot of time in prison, and the youngest brother, Raji, was too young to help with the income. The mother was thus forced to take a significant role in family finances and the development of the house. In 1968 Naji’s mother started working as a maid in the Psychiatric Hospital next to Dheisheh. With her income, the family was able to build a new room for the kitchen. It was constructed of cement block walls and a sheet metal roof that would blow off in winter and fly to the top of the mountain. Over time the cement blocks began to fall apart and ruin their supply of rice, flour and oil. By the end of the 1970s, Naji started building a garage towards the street to occupy the land that had previously housed the public toilet. He also prepared a foundation and made plans for a new house. The struggle of living in poverty and only being able to build what they could afford was a shared reality among many families— a hardship over which they were able to connect and form social bonds. Furthermore, as construction was dependent on available resources, social connections played an important role in acquiring affordable building materials and labor. Friends and neighbors would frequently help with construction. Naji married Suhair in 1987, and they lived together in the house with Naji’s mother and younger brother Raji. In 1993 with the stable income that came from Naji’s job at a local non-governmental organization and Suhair’s at a hospital, they managed to add two floors and finish the house. Situated on top of a hill overlooking the camp, the Al Feniq Cultural Center is built on a strategic position with a long history of oppression. The site was first occupied by the British army during the British mandate, then the Jordanian army and finally the Israeli army. When the Israeli army partially withdrew from the West Bank and left the site in the early 1990s, it was claimed by real estate developers for building either a tourist attraction or a prison. The refugee community wrote to President Yasser Arafat in response, claiming the site as belonging to the camp as a much needed space to alleviate its high density. A few months after Arafat agreed, a cultural center started being built. After building walls around the perimeter, a wedding hall was built starting in 1996 by the local community. Construction was disrupted by the second intifada and the Israeli military’s invasion of the site. After the Israeli military left again, refugees repaired the building and continued on with construction, adding a gym, guest house and the Edward Said Library. It was at this moment that people decided to call the cultural center “Al Finiq” after the mythological bird, the phoenix, symbolizing rebirth from its own ashes. A garden was opened in 2004 that gives inhabitants of Dheisheh and the nearby towns an opportunity to spend time with their children. In 2008, a second wedding hall was added to the site on the upper level of the garden, where meetings and conferences can also be held. Al Finiq demonstrates the rich social and cultural values of refugees in exile, while at the same time opening up new forms of thinking and fighting for the right of return. Discourse on the right of return tends to oblige refugees to forget and repress the culture produced during their period of exile. Yet asking refugees to destroy their life in exile and existing networks of social relations in order to go back to their origins would be akin to a second Nakba. Thus, when Naji Odeh, the former director of Al Finiq, was asked if building the center was a form of settling down in the camp, he replied, “I’m ready to demolish it and go back home; or even better, I’d like to rebuild Al Finiq in my village of origin.” Al Finiq is a bridge that connects sites of origin and exile. It is an example of how the refugees of Dheisheh have managed to build collective structures without undermining either the exceptional condition of the camp, the condition of being in exile, or the right of return.